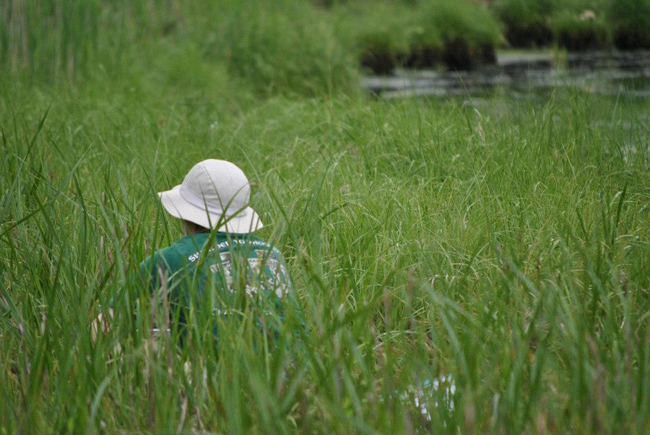 Mary Alldred in Spartina alterniflora marsh at East Creek (Sands Point, NY). Credit: All photos courtesy of Mary Alldred. Stony Brook, NY, August 20, 2018 - Scientists are trying to protect the health of salt marshes, important ecological features on sea shores that filter water, buffer coastal land from the seas, and host a variety of marine life. In extreme cases, salt marshes shield land from violent coastal storms and absorb water that otherwise might flood populated areas. In short, marshes benefit humans and the environment in numerous ways. Unfortunately, human-controlled factors could harm these natural areas. Runoff of nitrogen occurs when agricultural fertilizers get washed into streams, rivers, and lakes, or when improperly maintained septic systems leach into the water. Add in climate change and expected rising sea levels. 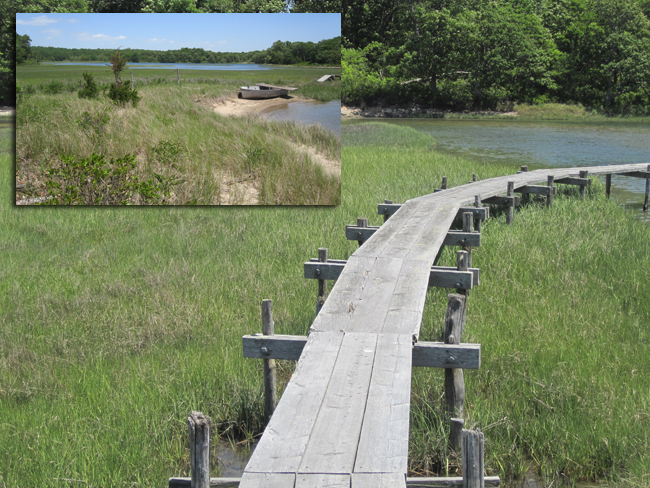 Both pose challenges for salt marsh health. Alldred completed this project as part of her doctoral dissertation research at Stony Brook University. She is now an assistant professor at the State University of New York in Plattsburgh. 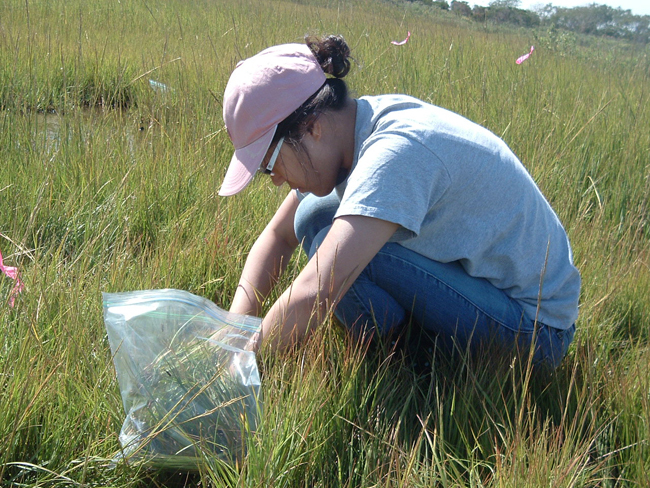 In her recent paper titled "Impact of salinity and nutrients on salt marsh stability," published in Ecosphere, written with Anne Liberti and Stephen Baines, and funded in part by New York Sea Grant, she and her team studied factors of salt marsh health, in particular salinity—the amount of salt dissolved in the water—as well as nitrogen content. The Spartina alterniflora is noticeably shorter at the Mashomack Preserve on Shelter Island, NY. This site is one of the most remote and has some of the lowest nitrogen concentrations on Long Island. Spartina at this site tends to be shorter and have very dense roots. 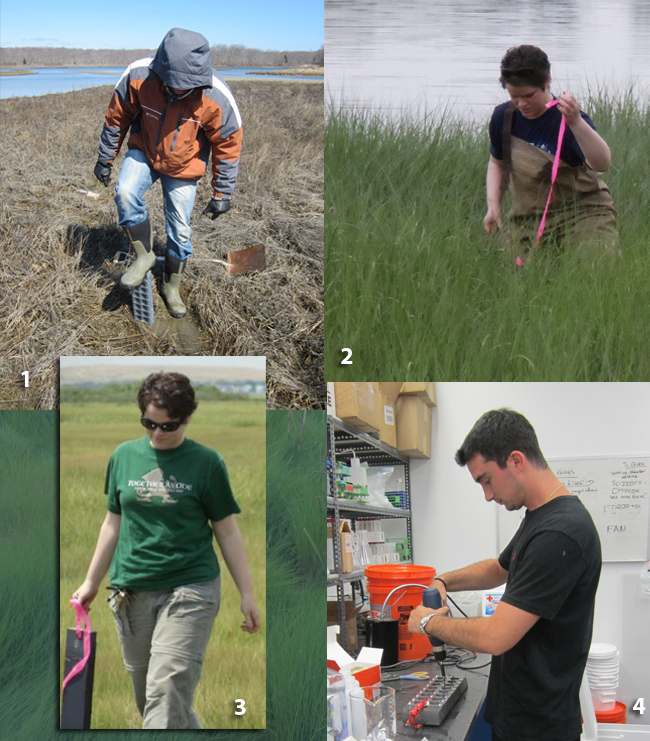 They studied 11 marshes on Long Island where a specific plant—Spartina alterniflora—grows. They found that below ground, plant biomass was reduced in high nitrogen marshes and enhanced in high salinity marshes. Former Stony Brook University undergraduate Sangmin Pak harvesting Spartina alterniflora aboveground biomass from Lido Beach (Hempstead, NY). When the investigators reviewed earlier scientists’ work, they encountered a theory positing that plants don’t have to work as hard to get nutrients in high-nitrogen water environments, so they grow fewer and smaller root systems. However, other research suggested a different effect, that larger aboveground stems and other plant material, or biomass, would require larger and more extensive roots. In an alternate idea, high nitrogen might limit another nutrient, such as phosphorous, which would still require extensive root systems be maintained by the plants. Higher nitrogen levels also could lead to greater belowground biomass if the overall growth increase compensates for the lower allocation of the plant's nutrients and energy to roots and rhizomes (the underground stems that form roots and new plant structures). Another chemical component of salt marshes are sulfate ions. Again, there are differing interpretations of how they might affect marsh health. Because sulfide is toxic to plants, root production would be expected to decline. However, plants may increase their root density to get enough nutrients, and thus introduce more oxygen into the system, turning sulfide to non-toxic sulfate. Plants also may grow more and larger roots directly in response to low oxygen in high sulfide. This allows them to transport oxygen into the sediments, enabling their roots to access oxygen for respiration and decreasing the amount of sulfide. At an extreme, high nitrogen levels in a body of water lead to a condition called eutrophication—where excess nutrients bring about algae and plant growth and oxygen deprivation. As sea levels rise, marshes must accumulate sediment and organic matter while resisting erosion from waves and storm surges. Why it matters: Those thick and sprawling root systems give strength to the salt marshes, holding the soil and organic matter in place, so it doesn’t all wash away under the stress of a storm. The investigators looked at salt marshes that were located close to extensive human activity, while others were more remote. In doing so, the investigators were able to consider the implications of human activity over long timescales. (At left) Former Stony Brook graduate student Stoycho Velkovsky running extractions to determine nitrogen availability in marsh sediment samples; (At right) Mary Alldred determining total carbon and nitrogen content of marsh sediments on an elemental analyzer in Dr. Alistair Rogers' lab at Brookhaven National Laboratory. Overall, they found a 60-70% reduction in belowground biomass (root systems) and 70% increase in aboveground biomass (stems, leaves, etc.) with increased dissolved inorganic nitrogen (DIN). They found increased salinity had an opposing effect, an up to 70% increase on belowground biomass. In short, nitrogen loading harms marsh stability. Also, as DIN increases, biomass and sediment retention may be more dependent on sediment delivery via streams and the strengths of tidal and storm surges. IMG_0291 Former Stony Brook University undergraduate Ashley Moreno at East Creek (Sands Point, NY). 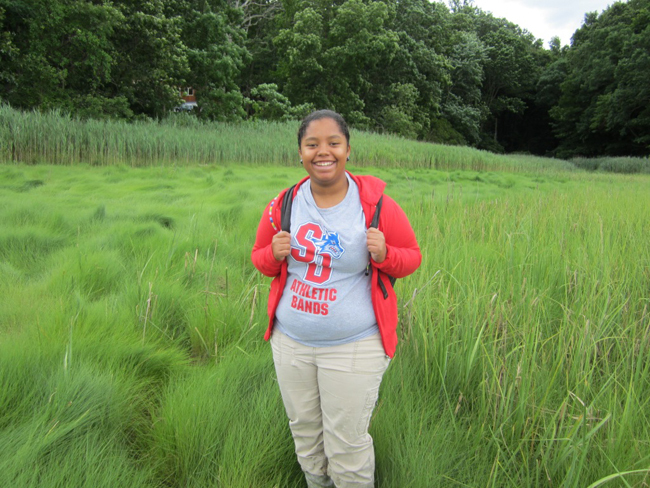 Ashley is standing at the transition between Spartina alterniflora (taller grass) and Spartina patens (short, high-marsh grass). You can also see invasive Phragmites australis in the background of this photo. Alldred is now pursuing a number of projects that all focus on ecosystem services that wetlands provide, as well as the influence of plants on sediment microbial processes. (1) Former technician Lucas Merlo installing porewater equilibrators in Mashomack (Shelter Island, NY); (2, 3) Mary Alldred retrieving porewater equilibrators — devices for sampling nutrients in water — from East Creek (Sands Point, NY); (4) Former SUNY Oswego undergraduate Louis Piscopo assembling porewater equilibrators for a summer research project at Stony Brook University. Alldred, M. (November 2017). "Impact of salinity and nutrients on salt marsh stability." Ecosphere: 1-10.